I was just going to make a quick little run into Walmart a couple weeks ago. I don’t even remember anymore what I went there to get. What I do remember was an “endcap” display that took me totally by surprise. There at the end of an aisle all nicely merchandised together were the three ingredients most often used to make homemade laundry soap – washing soda, borax, and Fels Naptha bar soap. This had to be intentional. Usually washing soda, borax and Fels Naptha soap are more obscure items to locate and there will only be a few boxes or bars available on a very top shelf or very bottom shelf. They don’t usually get prime shelf space. And here they were, in large quantities, in a very obvious spot! This was so unexpected to me that I even took a picture. 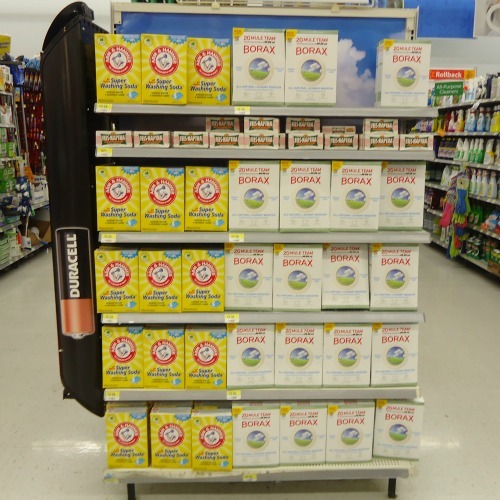 “Yes I do!” I answered “and Walmart must know what we’re doing to have made a display like this.” She went on to tell me how much she liked making her laundry soap, how much money she was saving, and that she had no plans to go back to the ready made stuff. We had a nice little chat and then parted ways, having enjoyed that brief moment of running across a Make Your Own kindred spirit. So somebody in Walmart management has been alerted to this growing movement of making your own laundry soap mixtures. I was encouraged to see these ingredients being made more readily available as often times finding the ingredients can be the hardest part of the recipes for some folks. There are more and more homemade laundry soap recipes out there now, all of them using slightly different ratios and measurements. But I think every one of them uses washing soda and borax, and then adds some kind of bar soap or liquid soap. A few of them add some baking soda too. Since I first tried and wrote about this homemade liquid laundry soap recipe, I have been quite happy with it and continue to use it. I’ve also enjoyed my Big Batch Powdered Laundry Soap recipe. It lasts a long time and does a great job of deodorizing. I have wondered though, if the borax ratio is a little high in that recipe. So when I needed to make a new batch of powdered soap today, I decided to give the following recipe a try. I liked the combination of my two favorite soaps for laundry, and the washing soda and borax ratio seems about right too. Combine all ingredients. Use 1 to 2 tablespoons per load. Do you have a favorite homemade laundry soap recipe or method? And – do you have any problem finding your ingredients? The campaign for Walmart stocking washing soda, borax and fels naphtha soap began in Greenville PA years ago. I worked with the manager of that department ( a nice man named Dave) and eventually the products appeared. Since then I have found the 3 products in every Walmart across the USA that I have visited. Perhaps it may be that I am not the only shopper to press Walmart for these products? I sure would like to hear from others about their efforts. Do you have to use the soap bar? Can you get away with only using borax and super washing soda? Well, I think you probably need some kind of soap to work as a cleaning agent. I’ve seen a recipe where powdered Oxi-Clean was added instead of a grated bar of soap (use equal parts of Oxi-clean, Washing Soda, and Borax). Perhaps you could give that a try if you want to skip grating the soap. A word of caution: do not use a product containing oxiclean on any fabric that has metallic decoration. A more natural option might be to find a way to incorporate tea tree oil into the wash load. I’ve never tried that so I’m not sure what quantity would be appropriate, but tea tree oil is said to have natural antibacterial properties. I found a recipe for powder laundry detergent that I like very much. It uses ZOTE soap instead of Fels Naptha. ZOTE comes in bars and you can microwave it, according to this website. I found ZOTE flakes at Wal-Mart and got a box which equals 2 bars. I used the flakes in the recipe below and it came out wonderfully. I hope you try it. I’m new to soapmaking and want to mix a full bar of ivory and half bar of gels…will this be a good idea? Also, two of my three sons have eczema, and my husband has super sensitive skin. My boys are breaking out less since we switched to homemade laundry products, and my husband isn’t getting rashes nearly as often. We had already switched to castile soap for bathing, and it helped, but the change in laundry soap made a huge difference too! I’ve been making my own laundry soap for a long time now. I love it! I’ll never go back to the store bought stuff! I don’t even need to use bleach on my whites anymore! I use a powdered recipe. I use 4lb super washing soda, 4 lb borax, 1 lb baking soda, 1 lb oxyclean or similar product, 1 bottle Purex crystals, and three bars of Fels Naptha. It lasts me about a year, and I do about 4 super size loads of laundry each day. It cleans much better than the Tide I was spending 17$ a week on! I’ve noticed that I HATE the smell of store bought detergents now! Even the “free” stuff that isn’t supposed to be scented! I haven’t had any trouble with fading if I use my dryer, but I have noticed that dark’s tend to fade more with this detergent when I hang them out to dry. My solution has been to turn them inside out before hanging them outside. It seems to help reduce the fading a lot! I also add about 1 tbs of original blue Dawn dish detergent to the whites when I wash my husband’s work shirts. They get pretty nasty, and adding a little dawn is much cheaper than the stain removers that you spray on! Homemade laundry soap does last a long time and that’s awesome that you only need to make your soap one a year (for a lot less money too!) Thanks for sharing how its been working out for you and the recipe you’re using. We can all learn together! i was wondering 2 things. 1 is this laundry soap unscented and 2 how is it for sensitive skin. reason why i’m asking is that all 3 of us have extremity sensitive skin and all but unscented tide gives me migraines to the point of getting sick some times. Andrea – This homemade laundry soap uses Fels Naptha soap which does have a fragrance so I can’t really say that it’s unscented. However I have used this mixture on my son’s laundry (who was always prone to breaking out in hives from certain scented soaps) and he has had no reaction to this mixture. So in our house it worked OK for someone with sensitive skin. I will have to remember that trick and give freezing the bars of soap a try! Does this work on oilfield workers stains? Oily stains can be some of the hardest stains to remove and as much as I like my laundry homemade soap, I don’t know if it would be strong enough to handle an oilfield worker’s oily stains. I have found that a good homemade stain remover (even for oily stains) is to combine one part Dawn dish soap to two parts hydrogen peroxide and let it set on the stain for several hours. Another way to boost the cleaning power of your homemade laundry soap is to add a scoop of oxyclean in with your load of wash.
To those that live in Canada: Sunlight bar soap is available instead of Fels Naptha! To those that live in Canada: Sunlight bar soap is available instead! Also, I did some reading since viewing your page here (LOVE your site btw!) and I read that Fels Naptha can cause some skin issues with some people that have sensitive skin. Glad to hear your enjoying the blog! Ivory bar soap is a very gentle soap and might be a good option for those with sensitive skin. However Fels Naptha (and maybe Sunlight too??) is actually sold as a “laundry” soap so I’ve always thought it’s got a little more cleaning power. Hi Nikki I too live in Canada, howdy neighbor. I had tried both sunlight and ivory without much luck. There is also a brand bar soap here named “Linda” that looks like and seems to be the same as the fels naptha. I use it in my homemade laundry soap and it works great. It can be found at Walmart, Food Basics and a couple of others I can’t recall. Just another idea…handcrafted soapmakers make a all lard, 0% superfat soap, no color no scent that they use for the ‘soap’ part of the laundry soap recipe. Better choice than Fels Naptha, which in the soapmaking community is a big no. So this involves learning to make soap which will then lead you to never buying commerical soap again, which is a good thing for our skin. Do a Yahoo search for soapmaking groups to join and learn the art of making soap. I have made my own soap and it is quite a process and an investment for something that you are trying to save money on so unless you plan on doing it forever or selling it I would stick with fels naphtha or find something else if you have an aversion to it. The laundry soap is going directly on your skin- it is being washed away. And I made homemade soap not using lard but by using a combination of vegetable oils. I have tried the homemade powdered soap and it changed the color of my sons shirts, they got very dull and looked washed out even though they were new. When I grated the fels-naptha I was having trouble breathing and I new it was the soap. I went back to the store boughten stuff and we haven’t had any problems since. My niece makes her own soap and swears by it but it sure didn’t work for me. I, too, have suffered the discomfort of breathing in fels naphtha dust, so I wear a nose/mouth mask for that task. If you have your water analyzed you may find that the minerals in your water supply have something to do with the color change. Makes me ask what is in commercial products that prevents discoloration. What is the recipe for liquid laundry soap using castile, please? I love it for other things( Hand soap, body wash, etc. ), so I buy it by the gallon (much cheaper per oz. when I buy it this way through Azure Standard). My hubby loves the convenience of the laundry pods, but I want to get back to natural ingredients and a cheaper alternative. Great blog, btw. I’m not surprised that your Walmart caught on to their customers’ buying trends and made it easier to find the ingredients. If nothing else, they have smart marketing people. Did you notice an increase in price? I have this recipe tucked away (but haven’t tried it yet) for laundry soap made with castile soap. It uses 1/3 to 1/2 cup of the castile soap, 1/2 cup washing soda, 1/2 cup borax, and 2 gallons of water. The recipe says it will be a thin mixture and to use about 1/4 to 1/3 cup per load. So far I haven’t noticed any increase in the washing soda or borax at Walmart. Yay! I make washing soda by buying a 50 lb bag of feed grade sodium bicarbonate from a farm supply store for $16. And then bake it at 400* F for about an hour(maybe overkill but it works!). I buy the 4.75 lb. box of borax at a local store for around $3.50(the most expensive part). I can’t stand the smell of Zote of Fels Naptha or any other laundry bar for that matter. So I make my own with cheap soybean oil, water, and lye. I don’t add any anything else like essential oils or dyes and I make it 0% superfatted so it rinses cleanly and smells like nothing but clean. Donna – perhaps you could try substituting grated bars of Castile soap (or liquid castile soap) for Ivory or Fels Naptha. Castile soap is a plant based soap which might be more gentle for your skin. No-grate tip for the Ivory soap: Have you ever seen that “experiment” where you put 1/4 to 1/2 of the bar of ivory soap in the microwave and watch it turn into a big giant puff? Well, I noticed once that puff cooled off, it crumbled into powder in my hands. Immediately it clicked! Put that powder into my homemade laundry soap and it worked perfectly! So much quicker than hand grating and no need for overworking the food processor! I watched some videos on YouTube with people putting their soap in the microwave, but was kind of nervous to give it a try. Was worried my microwave might smell like soap for weeks. I think doing just 1/4 to 1/2 a bar of soap at a time like you said makes sense. I might have to get brave and give it a try! For unbeatable scent, i also crush up some Downy un-stoppables in my powdered detergent. I love the smell and was saving so much money that I didn’t feel bad about spending it on the downy. 1 jar will do 3-4 big batches. Hi Sheila – your measurements sound like they should work well! If anything, I would think maybe you could get by with just one bar of grated soap in ratio to the 4 cups of borax and 4 cups of washing soda. I also think 2 tablespoons per load should be about right. Stop back some time and let us know how your recipe is working! Sheila – I have only noticed a couple times that a piece of clothing that was very bright faded a little bit when I used my big batch powdered laundry soap. I haven’t noticed any fading with the “liquid” recipe that I use and tend to use that if I’m doing a load with a very bright piece of clothing. I have not noticed it with “darks” really, just a couple time with very bright t-shirts that lost a little bit of vibrancy (but not much). I don’t wear too many really intensely colored clothes so its hasn’t been much of a problem for me. For fabric softener, have you tried the wool balls? I have been using the wool dryer balls for about 6 months now and will never go back to stinky dryer sheets. I put white vinegar in place of liquid softener in the washer and use 2 dryer balls in the dryer. I just recently started using the homemade laundry soap. I’m also making the cleaner recipes you’ve posted. My aim is to get rid of as many artificial scents and perfumes in our house as possible. I believe they can cause a lot of health problems and let’s face it we can all stand to be a little healthier. Love my wool dryer balls! I have a set of white and a set of black for darks. They reduce dryer time tremendously and clothes, sheets, towels are softened. Life is good! I’m nosy about thise recepie, but what is bar fels ore ivory bar soap? Is it a block of handsoap??? Being nosy and curious is OK with me! Fels Naptha is a bar soap that is for laundry purposes. It is not intended as a body soap. Ivory soap is also a bar soap but it is sold mainly for washing the body. However because it is a very gentle soap, it works well in homemade laundry mixtures especially if there is a family member with sensitive skin. These soaps are probably not for sale in stores in Denmark where you live, however they can be purchased online on Amazon if you wanted to purchase them. BUT – if you have some type of bar soap in your country intended for laundry use, that would work great too. Also, bar soaps for washing the body work well too, just make sure you use a bar that does not have moisturizing oils in it. Hello, How long one should microwave the Ivory Soap in order to achieve powder texture in a container? Thanks in advance! Sorry I just saw the comment for Ivory Soap microwaving 1 min. Beverly! How hilarious! I can picture you standing there feeling totally amazed at Walmart! I have been using Fels Naptha for years and years…. my mom used it. You have inspired me to finally try your laundry soap! by the way – your blog looks great….I haven’t been here in a while! Keep it up! What is the recipe for the liquid version? 10 gallons for a buck sound unbelievable!! I have been making my own soap. I was using the Fels Naptha until I realized that this soap is also made from Crude Oil. It has the same ick that normal detergents have. It is better to use a castile soap to make detergent from since it is made from ingredients like olive oils. Also if the Washing soda becomes pricey I read that you can buy the normal baking soda and bake it in your oven for 1 hour at 400 degrees and it will turn it into baking soda. You can Google all of this. Our household is getting rid of all chemicals and going green so what we put into our laundry and other cleaning items is very important. It will turn into *Washing Soda* LOL, I guess I should of proof read myself first! Will this work in a HE machine? Yes, homemade laundry soap mixtures like this powdered mixture work in HE machines because they do not suds. I’ve been reading alot about homemade laundry soap and am thinking of trying it to use in my HE machine. I understand it doesn’t suds up which is why it supposedly can be used in HE machines. Mind you, I also understand that appliance manufacturers are often ‘playing together’ with the soap manufacturers to help each other’s business thrive. So maybe it’s OK to use homemade anyway. Just wondering if anyone else has stalled on using their own laundry soap for this reason…as I have? And I gotta say, I do like having the fragrance of the ready-made so I’d be looking for some sort of essential oil to add to the homemade version. I have used my home made powder laundry soap in my HE machine since I bought it 4 years ago. It’s an LG. no problems at all. No- you have a light ivory scent in the air but it goes away quickly. It didn’t bother my kids or DH. What got me was when I crumbled it up all the particles flying everywhere. On the next half I just put it in my plastic container and shook it up and it disintegrated into a fine powder. Much better than doing it by hand. Also- only do a half a bar at a time- it gets huge! Kids loved it! If you use Ivory bar soap (substituted for the Fels Naptha or Castile), you can actually microwave it for 1 minute, let it cool just a bit, and then just crumble it with your fingers instead of shred it!! The other soaps won’t work, though-I tried! I watched a YouTube video of someone doing this! I always wondered if my microwave would then smell like Ivory soap for a week. Does anyone know?? Is it okay to use these detergents in high efficiency washers? My understanding is that yes, the homemade soaps are safe to use in high efficiency washing machines because the homemade laundry soaps do not suds. There are some homemade recipes out there that use Dawn dishwashing liquid, and those suds up a little bit more, but still not to any degree that it should be a problem. Can you add something for scent? Like we can with other cleaners. I would like to try to make the dry version. Usually essential oils for scent are not added to the homemade laundry soaps as people were finding the scent didn’t really last through the wash. One homemade option to add a nice scent is to make your own fabric softeners. There’s a recipe for homemade fabric softener using hair conditioner in a nice scent (and I’m actually testing that recipe out right now). I’ve always been surprised that even though the Fels Naptha soap has kind of a distinctive smell, it doesn’t seem to make your clothes smell that way at all. You can as a liquid fabric softner make a batch of vinegar and essential oils to your wash. The essential oils that you use are the ones that are naturally anti bacterial and the vinegar helps clean the clothes. I will include a link to a blog about it. I save the rinds of citrus fruit and put in a large container then cover it with vinegar to use as my fabric softener, 1/2 cup per medium load. I have replenished the vinegar many times and it still has the fresh citrus scent. I used the hair conditioner fabric softener a few times and it seemed to work pretty well. You’ve reminded me that I should try using it again. I found the recipe floating around Pinterest and it’s a combination of 2 cups hair conditioner, 3 cups vinegar, and 6 cups warm water. I make my own as well tho, I use the liquid version. Can’t beat 10 gallons of detergent for around a dollar! With a family of six… Can’t beat that. I do love your blog and I do think you are right about Walmart. That was NO accident! 10 gallons of laundry soap for about $1.00 is awesome Kristy! Price savings like that are always great motivation to Make Your Own! LOVE IT! Finally! Great post. I need to get on board making my own like this. It’s easy to do Robin! We would gladly welcome you to the Make Your Own laundry soap crowd! I make my own laundry soap. Rather than using the Fels Naptha bar I make my own laundry bar soap. I got the idea from the following website. I will grate one bar of this soap and add to it 1 cup each of borax, washing soda, and baking soda. I use 1 & 1/2 Tablespoons per load. It sure saves money. I have a friend who was making it with the Fels Naptha soap and her little guy broke out in a rash. I gave her one of my bars of laundry soap and she uses that and he is now rash free. Thanks for the link to the laundry bar recipe Cheryl. Very Interesting! I bookmarked the page and I think I might have to add that to my To Do list. Fels Naptha does have a distinctive fragrance and I would wonder if whatever gives it the fragrance is what might make someone have an allergic rash. I can see where making your own bar soap would be the answer to that problem. Thanks for sharing your laundry soap recipe! He most likely broke out because Fels Neptha is not organic, it is made from crude oil. So it has plenty of chemicals in it. It is best to stay with organic soaps. JaNita, I’m going to be picky here. Anything you can touch is made of chemicals – you, your frying pan, dirt, oil, and everything else. And every one of those chemicals is natural (meaning created by God to exist here on earth). Take a fresh olive and squish it with a hammer and, amongst all the other mess will be some crude oil. So I think you meant that Fels-Naphtha is made with petroleum products. Some people are allergic to some of the chemicals in naturally occurring petroleum products. Some are allergic to chemicals in naturally occurring peanuts – or to water itself (fortunately that one is very rare). Most people who think they are allergic to something – aren’t. Most have sensitivities to those things that cause the reactions they don’t like (reasonably enough). The chemicals we eat can be organic or inorganic. The inorganic ones would be in things like baking soda or salt. The organic ones include most soaps as well as most detergents. Realize, though, that everybody is different. My family shows less sensitivity to clothes washed in All Free & Clear (but not All itself, or other Free & Clears) than to this less expensive detergent, whether with Fels Naphtha or the DIY soap Cheryl’s link points to. But somebody else would find Beverley’s DIY detergent (maybe with one of the modifications) less of a problem. Sorry for the length – but I see these comments so often where people have misunderstood the basics, which leads to other misunderstandings in other areas. Jack, This is quite possibly my favorite comment on the entire internet – or at least the portions of the internet that I have visited. I also try to enlighten folks when the actual meaning of something we are discussing has been skewed. There’s so much confusion these days created by incorrect definitions especially when it comes to “all-natural”, organic, “good for you”, etc. One of my favorites is to point out that Arsenic is also all natural. Thanks again for posting this comment. I do realize you may never see my response since it has been a few years, but I at least wanted to respond for posterity. Yes, I do make my own. Got the recipe off the Duggars’ website. I can appreciate the convenience of Wal-mart, or any of the other big stores, having all the neccesary components placed in one spot…..but when this happens, I do get a little worried too. It seems that’s when the price of said components go up in price, negating some of the savings of the finished product. A little bit like when Martha Stewart would take a liking to some vegetable, obscure by our American culture’s standards, cheap & easy to prepare…and then, overnight seemingly, the price would go up! I know what you’re saying Brenda. Once something goes more main stream things can change. Hopefully Walmart’s merchandising of these products won’t have a negative effect on the supply and demand.